For an EquityTouch demonstration, click on the button above and fill out the following form. Or contact us by any means listed on the Contact page. One of the many ways EquityTouch distinguishes itself from other CRM products is its superior searching capabilities. Search for contacts using different criteria, broken down by several fields under company, location, financials, person, touch, and communication. You have the option to delegate another user to “act” as you, enabling others to easily enter information in your behalf. With saved searches, EquityTouch offers useful ways to track your evolving data, keeping you and your team up-to-date on all collaborative efforts. 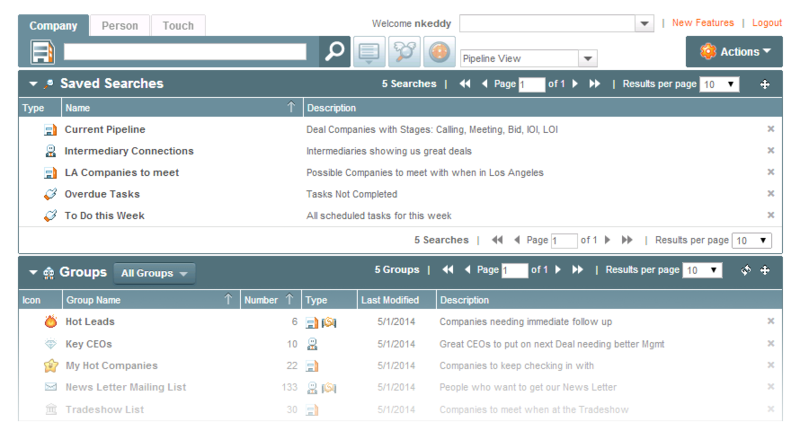 Groups enable EquityTouch users to group companies or People together that have no common data reference and display these records together in a search view. Company information can be viewed as the user would like it to be viewed. Sections can be moved from one part of the form to another. Avoid data entry and save time by importing data directly into EquityTouch from CrunchBase, Dow Jones, Bureau van Dijk (BVD), and AngelList. Quickly view recent touch activity from the Company and Person summary panel. Your best venture capital, private equity or alternative asset deals happen through personal contacts. Someone remembers something that someone said — perhaps over the phone, at a lunch or in an email. You won because you are one personal contact better than the competition — a Touch Ahead. Hundreds of these Touches occur every day all across your organization. So, where do you see the opportunities? How do you manage the connections? How do you make each Touch count? With EquityTouch from Touch Ahead Software. It’s the CRM solution built from the ground up specifically for the venture capital, private equity and alternative asset community. EquityTouch is super fast, easily customized and shows the big picture surrounding every Touch in every deal. And because EquityTouch is web-based, you don’t have to support it. It supports you. Your “personal Touch" inventory is a huge asset you can leverage throughout the deal cycle. So why wait? One of the many ways EquityTouch distinguishes itself from other CRM products is its superior searching capabilities. In this feature video, EquityTouch demonstrates its impressive ability to navigate through hundreds of thousands of records in seconds. With saved and shared groups and searches, EquityTouch offers useful ways to track your evolving data, keeping you and your team up-to-date on all collaborative efforts. Understanding how different people from different organizations relate to one another can be a challenge. EquityTouch tracks these complex relationships with intelligence, giving you the complete picture and showing you how everyone is connected. Email, calendars, and contacts created in either application — EquityTouch or Outlook — can be quickly and securely transferred to the other. This saves time, avoids redundancy, reduces data entry and eliminates potential errors. Investment professionals love to multitask. 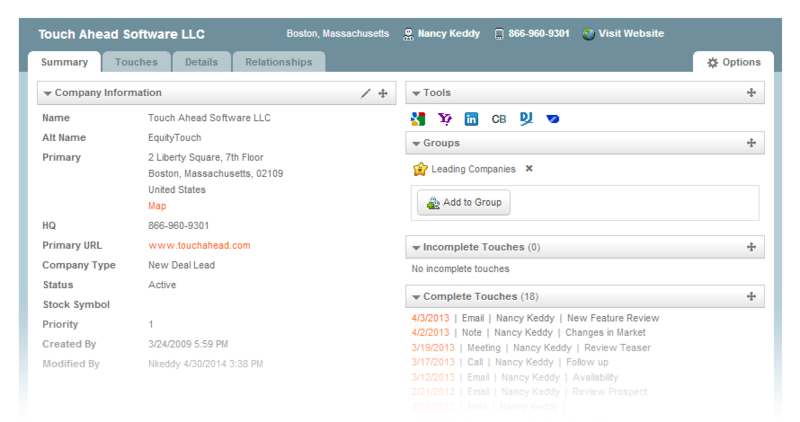 EquityTouch lets you search, view and update a company or contact information while you create another Touch. Track who is contacting whom, how, how often, and with what results. Statistics are updated dynamically. Touches are sorted by type and linked to the dynamic data results. Change screen layouts directly within the browser window without painful configuration settings or opening a new window. Avoid data entry and save time by importing data directly into EquityTouch from CrunchBase, Dow Jones, Bureau van Dijk (BVD), and AngelList. Get current information on companies and people from LinkedIn, Twitter and facebook profiles. Search Google, Yahoo Finance and RSS News with a single Touch!